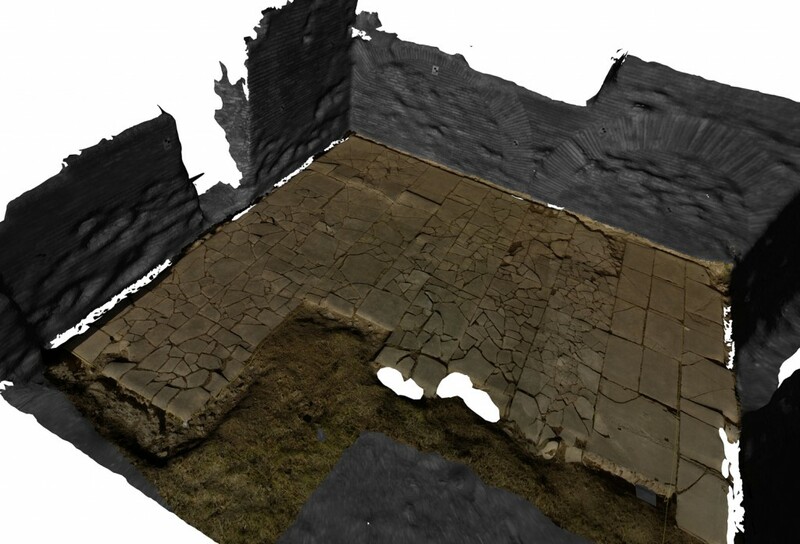 In 2010, the Berlin-team started to excavate a group of three rooms (MFR). 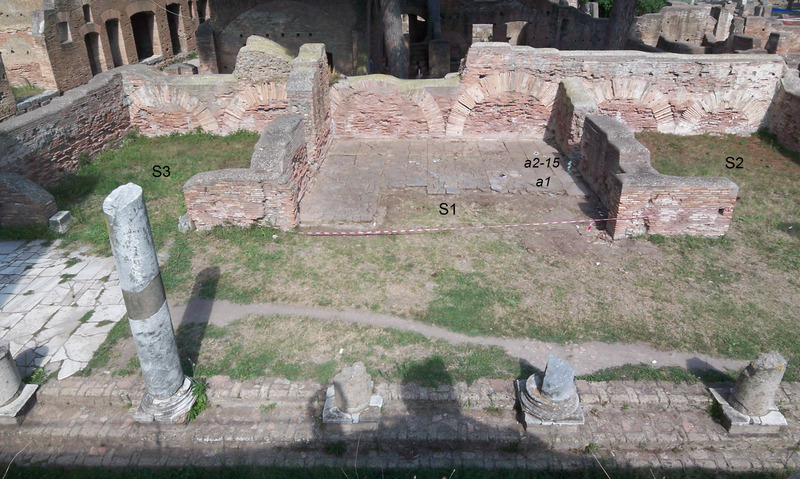 The south room of MFR showed traces of modern restoration, but only few slabs in situ (see pictures below). After de-vegetation, an almost completely preserved pavement appeared in the middle room of MFR (see pictures below). 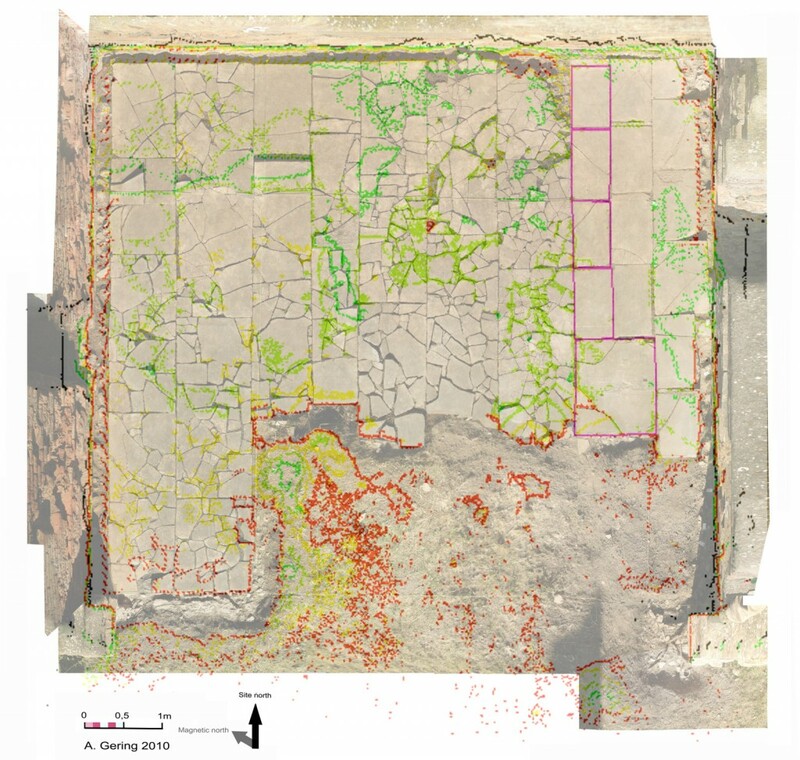 The geophysics of MFR show clearly the limits of the re-fill of the old excavations from 1912 (see picture below, marked in black are the pavement-slabs with mortarbedding in situ. In light-grey the areas of re-fill). 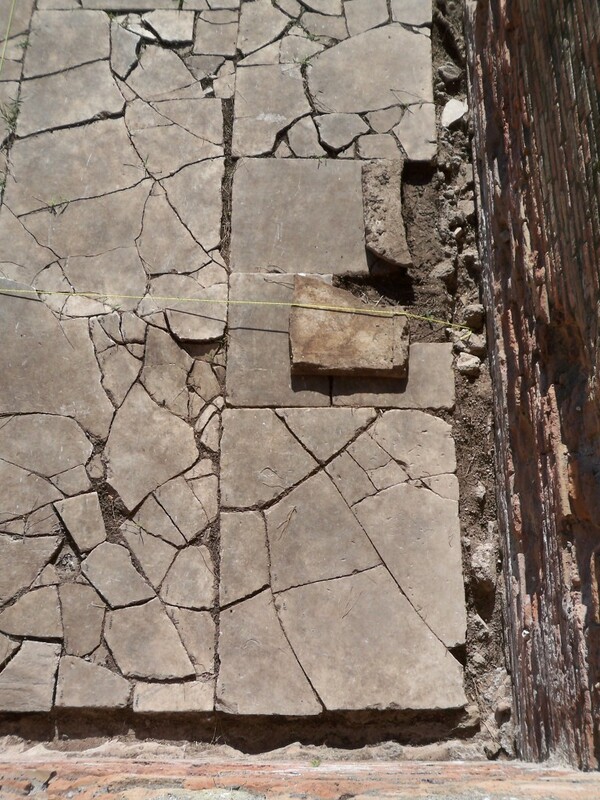 Though the area was excavated intensively before the First World War, the areas of the pavement in the middle-room remained untouched by the previous excavators. 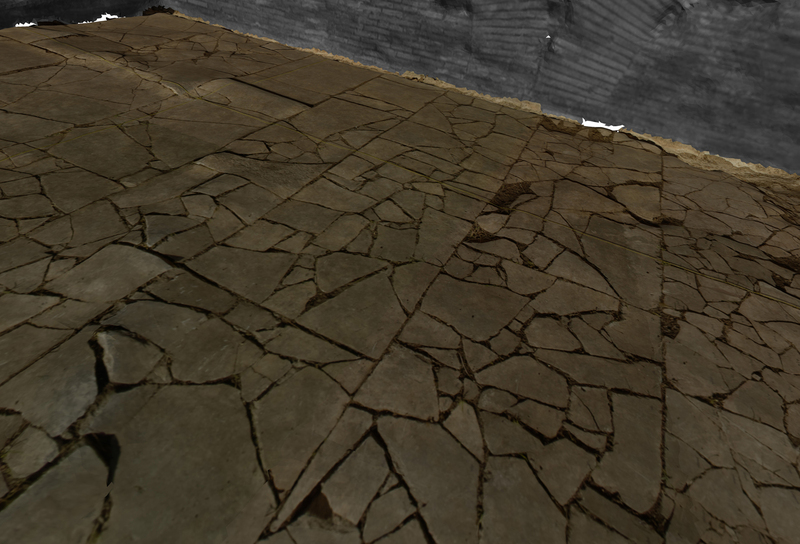 After the laserscanning and 3-D-photography it was possible to distinguish areas with different elavations of their mortarbedding. 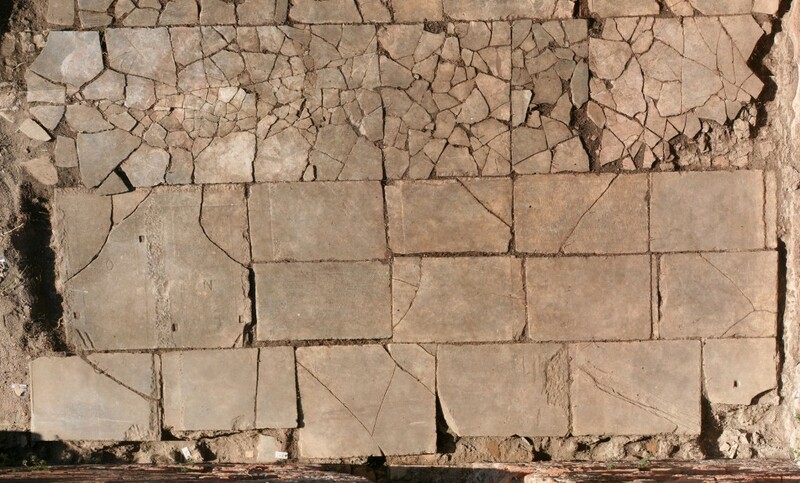 One set of pavement-slabs was obviously laid in the same sequence, and most likely at the same time, due to similarities in the mortar, the level of the mortarbedding, and the same mortar-type. This set of spolia is marked on the picture below (a1-a15). The laserscanning clearly defined the limits of the set of spolia mentioned above by a different height (see picture below, purple lines). 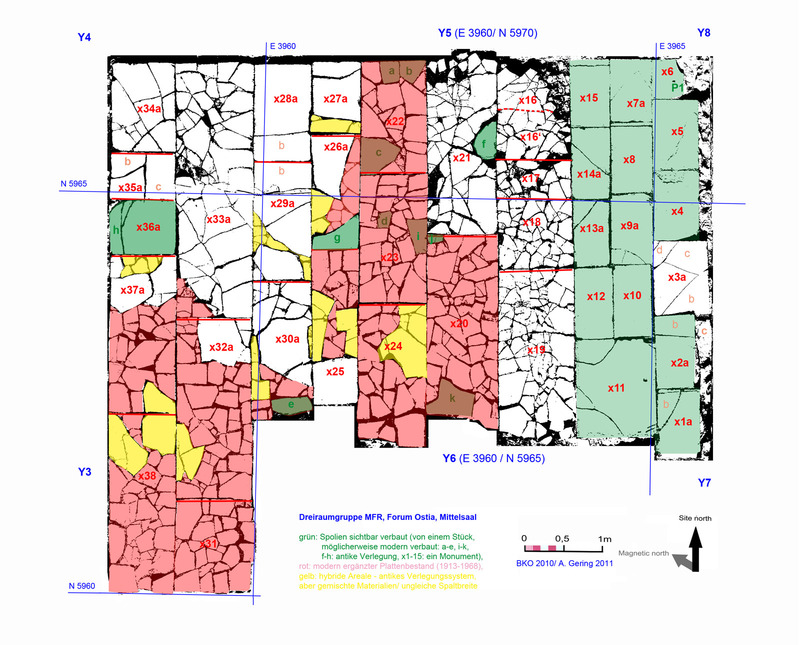 All pavement-slabs marked in green on the picture below are reused architectural elements of older buildings, which were destroyed before the pavement was constructed. The pavement-slabs x1-x15 have the same height and consist of the same material. They obviously once belonged to the same monument. The slab-parts x26g and x36a (marked in green), of which one was in situ (x36a) and the other one was inserted in the recently restored area of the pavement (area marked in red, see picture below), may have belonged to the same monument too. 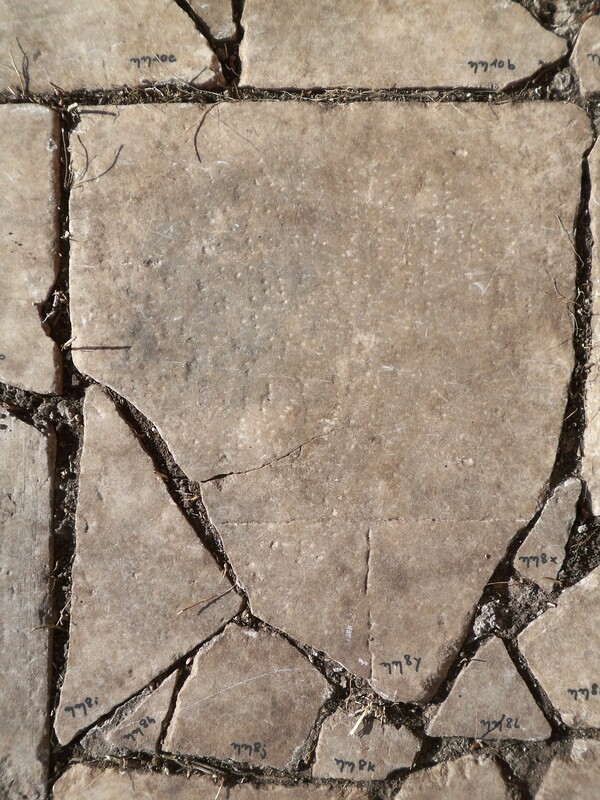 The slab-area marked in white is part of the original pavement from Late Antiquity, which is still preserved in situ. 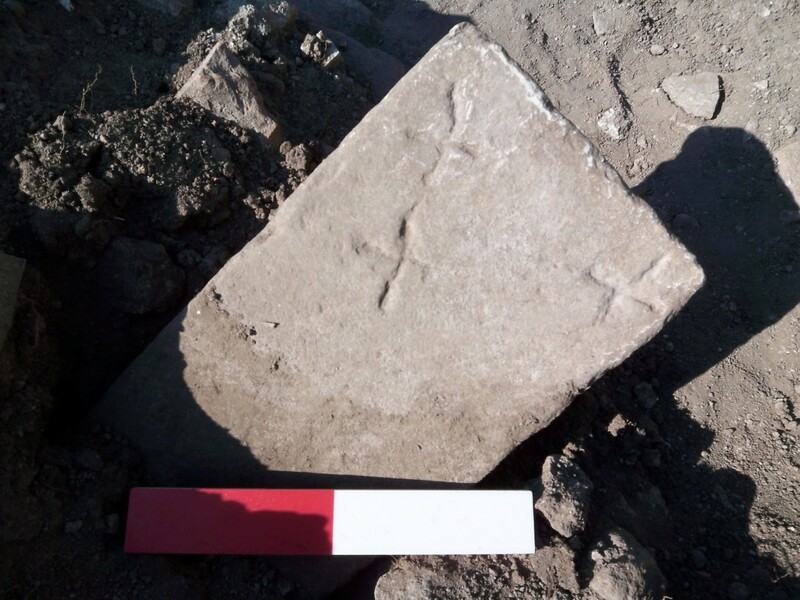 In this area, a reused roof tile, also known as a tegula, was found: x35a (see picture below). It is clear from the fragmentation of x35a, b, and c that the three parts belong to the same roof tile (see picture below). According to the typology of Daniel Damgaard, x35a-c could probably have been part of an unknown temple roof characterised by a distance of 1 m bewteen the antefixes. 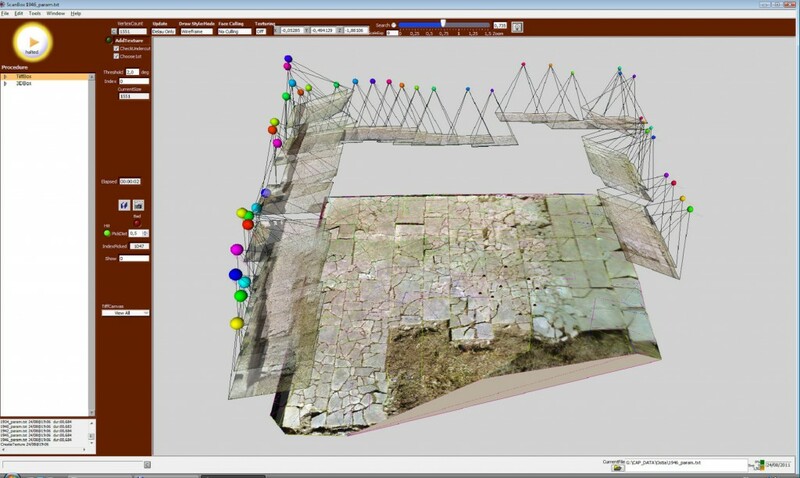 Due to these dimensions, it can be excluded as part of the originally approximately 1500 rooftiles of the Capitolium. It is quite probable that many roofs would have been partly or completely destroyed by an intense earthquake of the 5th century, which is stratigraphically verified due to the excavations of 2011-2013 (see sections“Rewriting Late Antiquity part 1” and “Rewriting Late Antiquity part 2“). In 2010, a cluster of roof tiles was documented in area E at FSE. By the typology of Daniel Damgaard, it can be argued that these 10 roof tiles (see picture below) belonged to the roof of the Capitolium, due to coherence in dimensions and marble type. The temple roof of the Capitolium could have been collapsed partially or completely, while only a small part of the tiles was in an appropriate condition for later reuse. 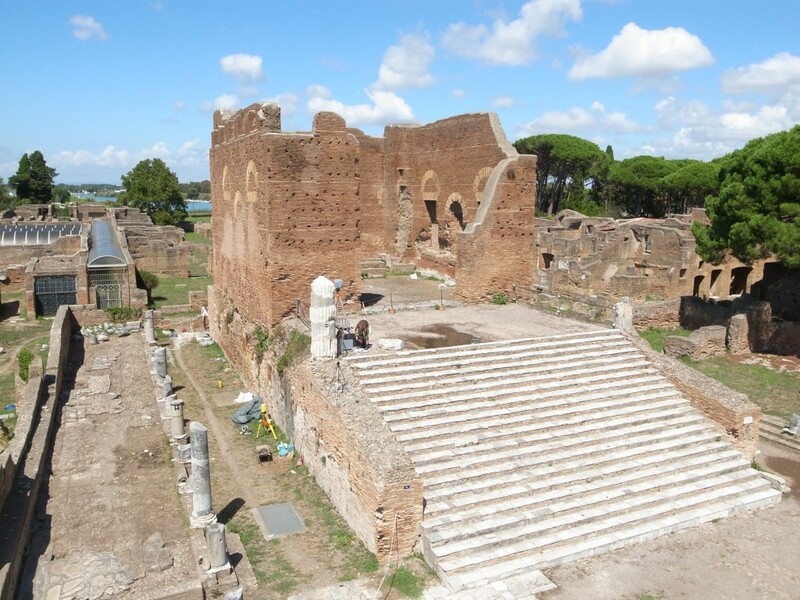 However, this does not necessarily define the final decay of the Capitolium as the most important landmark in Ostia’s cityscape (see picture below), because at least parts of the roof could have been replaced or repaired by cheaper terracotta tiles. Furthermore, an inscription found in the fundament of the cella suggests that the Capitolium was restored during Late Antiquity (see subproject“Ostian Marble Roof tiles: a typology“). The slab x11 (plan above, see detail below) was a base of a monument consisting of 10 slabs with equal dimensions. In 1912, the entrance area of the room was excavated. Vaglieri found an inscription that probably once belonged to the original monument. It was most likely reused here, due to its close-by find-position at the entrance, and its roughly equal dimenions. 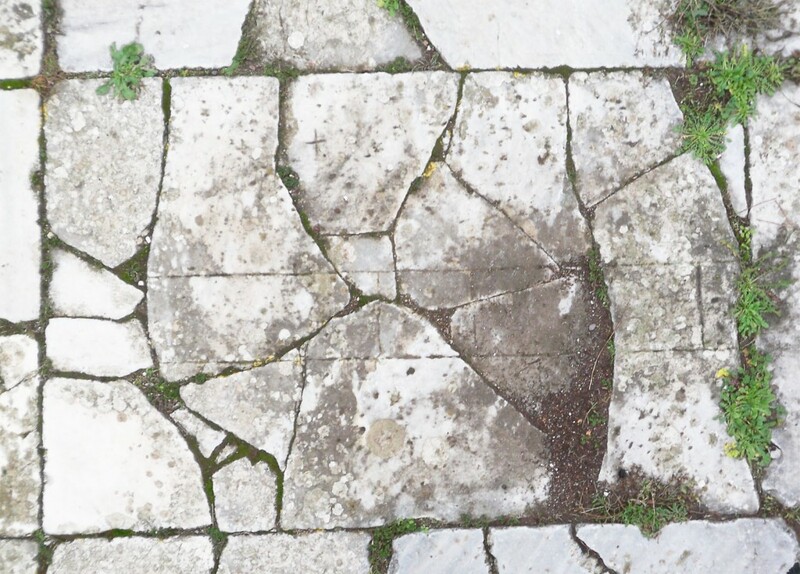 Many traces of graffitti can be found on the surfaces of the pavement-slabs of MFR, which have parallels in the Forum’s pavement itself or the nearby buildings and plazas (see pictures below).